As I read this book, I tried to imagine Kevin Randle's office. He is evidently a researcher par excellence, and has been accumulating data on the subject of UFOs for decades. I imagine that he must have several old filing cabinets packed full of material from the pre-computer and Internet days. His interest in UFO crashes and retrievals is clearly long-standing, and based at least in part upon the voluminous work of researcher Leonard Stringfield. This latest book chronicles about 100 cases, many of which have undergone more up-to-date research using modern search tools available through the Internet. As the author indicates, research can be conducted much more quickly these days, and a lot of these accounts have checkable details just begging for a sharp eye and inquisitive mouse. Where he is able to, Randles does a handsome job of dissecting the various cases before him. He reckons that there may be as many as 300 claims of UFO crashes. Of course, the vast majority of these are either bogus or easily accounted for with natural phenomena like bollides. Many of the rest crumble under his forensic eye. That leaves a core caseload of truly enigmatic encounters that suggest crashed saucers and stranded, or dead, aliens. It is a conclusion that Randles, a retired lieutenant colonel who not so long ago saw active service in Iraq, considers a distinct possibility. The author cleverly breaks up the pace of the book. It would be so easy to give each case roughly equal space in a book like this. A chapter for every five years, perhaps. But although the book is chronologically set out, the volume devoted to each case varies widely. This is partly based upon the evidence available, but also upon the author's interest in the case. He quickly dismisses the chaff (which after a while seem to follow a familiar pattern involving three dead aliens and an elusive flat-bed army truck) and engages his attention where it matters the most. This provides a logic and honesty which quickly provides compelling reading. He also sheds a wary eye across the entire genre. For instance, his insight that alleged encounters just prior to Roswell should have alerted the authorities to the physical reality of the saucers, and therefore prepared them better for the events of early July 1947, is a profound one. It indicates that such cases are unlikely to hold water. He is also keen to highlight the limited abilities of many of the more amateur UFO researchers down the years. This is important, because the hype they attach to their pet cases has a tendency to run away with them. As the UFO community grew across the States in the 60s and 70s, many local researchers longed for a big event to occur in their UFO jurisdiction, and tended to grab any half-opportunities of a sensational UFO crash with both hands. Randles carefully debunks such wanton research. Yet he does not seem to have an axe to grind. He even makes the reader aware that occasionally researchers debunk each others work to see off the competition, and thus keep their own case at the top of the pile. What a heinous minefield this subject is! I really enjoyed reading this book. Randles himself spends some time explaining why he dealt with the cases he did, and sets aside so many of the others. Given that, it seems unfair to point out missing cases, but as an Englishman I was very conscious that several cases on this side of the Atlantic (described by another Randles) were not included. I have a book by Jenny Randles entitled "UFO Retrievals" (published in 1995 by Blandford) which documents the evidence collected for several such cases, notably the 1974 Berwyn Mountains event near Bala. A presumed downed meteor (thus meteorite) was met with remarkable over-reaction by the UK armed forces, who cordoned off the entire mountainside for several days as they conducted a thorough search. I would have enjoyed reading Kevin's take on this case. It should be said that the spread of UFO crashes described in 'Crash' is very heavily weighed on the United States, and the more south western desert States in particular. Perhaps that represents a reality to the phenomenon, or perhaps indicates how a mythology has built up around downed UFOs within the American culture. UFOs are a worldwide phenomenon, and so statistically one would imagine that accidents would be spread more evenly across the globe (unless the US specialise in bringing these saucers down, of course). In the Cold War days, stories of UFO crashes in communist countries would likely have been suppressed, but in these more enlightened, globalised times such events should not encounter the same problems. I wonder if such a statistical analysis would create an informative picture of the phenomenon over time, and across continents? This book offers well-considered, forensic UFO research at its best, and will surely become a standard text on the subject of UFO crashes and retrievals. 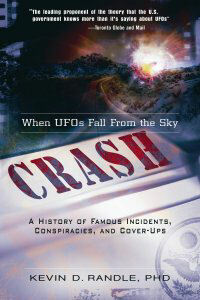 Subtitled "When UFOs Fall from the Sky: A History of Famous Incidents, Conspiracies, and Cover-ups"